Wayne McHugh was Fryston's man of the match. Picture: Matthew Merrick. Fryston Warriors booked a home semi-final against BARLA National Cup holders Thornhill Trojans on Saturday, April 29, by winning 34-16 at Widnes West Bank Bears last weekend. Thornhill beat Upton 34-26 in the quarterfinals. Pennine League champions Fryston have two important matches before they face Thornhill. 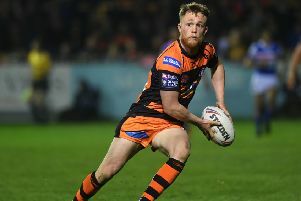 They take on Cutsyke Raiders in the Castleford and Featherstone ARL David Poulter Open Cup final at Castleford RUFC this evening (Thursday, 7.30) and they play Lindley Swifts in the Pennine League’s President’s Cup final at Bradford Bulls this Saturday (3.30pm). Fryston, sponsored by Monkhill Sandwiches, gave a clinical display at Widnes, despite a pre-match hitch. Their preparation was marred by a mix up with a bus company which saw them take the field only 15 minutes after arriving at the ground. It took Fryston a while to get into their stride and West Bank capitalised by scoring first when Jack Murphy went over and Matt Murphy converted. The visitors gradually started to find their rhythm and the pace at which they were playing soon found holes in the Bears defence. They levelled the scores when quick handling enabled Ben Strong to dart over and Andy Speake added the conversion. Fryston were now at their best and their forwards, led by Craig Jones and Jack Lee, were making massive inroads. It was no surprise when they scored again. They shipped the ball wide for Fryston’s speedy backs to send in Adam Rothwell out wide. The home side were now under the cosh and had a lot of defending to do to keep the score down. However, no one could stop Lee when he scooted from dummy half and his pace and power took him over. Fryston then became over ambitious with their attacking play. A pass went to ground and the Bears took full advantage when Lee Holland scored and Murphy goaled to put them only two points behind at half-time. Fryston came out for the second half knowing exactly what they needed to do to reach the semi-finals. They cut out the silly mistakes and concentrated on playing the fast flowing football for which they are renowned. It didnt take them long to extend their lead when Ryan Meah shot over for a try and Az Dobek took over the goal kicking duties to land the conversion. What became more evident as the game wore on was the speed with which Fryston turned defence into attack. Bears tried in vain to get back into the game. They fell further behind when Wayne McHugh went over and Dobek added the extras. The Warriors were now in total control of the game against outclassed opponents. They used their pack to make ground down the middle but instead of going wide they chose to keep it tight and the tactic paid off with Lee’s second try. Fryston continued to make all the running and constantly punched holes in the home defence. Clever handling saw Strong bag his second try to put the game beyond the reach of the Widnes outfit. Bears managed a consolation try in the dying minutes when Chris Cartledge crossed but they finished a well beaten team. Fryston’s man of the match award, sponsored by Martin Oxtoby and Alan Scarfe, went to McHugh whose pace and power was too much for the home side to handle. He was well supported by Craig Jones and Lee who both put in sterling performances in both attack and defence. Overall, it was an excellent all round team performance from Fryston who are aiming to continue their great record in knock-out competitions after retaining the Yorkshire Cup earlier this season. Hunslet Club Parkside host Orrell St James in the other National Cup semi-final. In the quarterfinals, Hunslet Club Parkside won 16-14 at Dewsbury Moor and Orrell St James came out on top 22-10 at Queens.